Life is a messy endeavor. Humor helps. Want to laugh with me? I wouldn’t want to face this mess! Her nature it seems is to drop things as she goes; she has yet to learn to befriend herself by keeping her things neat, organized, available, clean. I would love for her to learn this – for my benefit sure, but mostly for herself. Her mad scrambles for a particular shirt, a pair of shoes, a misplaced homework assignment are difficult, frenetic scenes to witness. I do lapse into hands on hips moments. I lapse into solving the problem for her. I lapse into detached apathy. I can be found to think the thought she will never get this and we who live with her will pay the price – I shrug, I shut the door, I sigh, I laugh. I detach from the idea that the state of her room reflects my parenting ability. What started out messy, when I left town last Thursday, has turned into frightful. Maybe she is getting ready for Halloween. 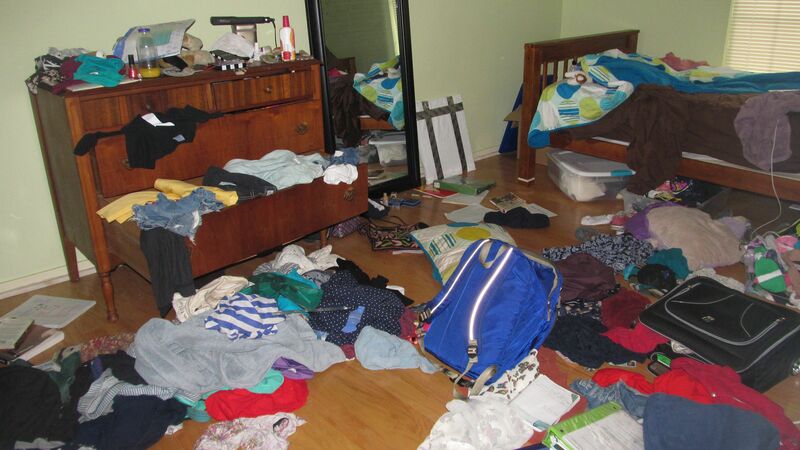 If the police were to enter the house unannounced, they would mark this room a crime scene. They would look for the thieves who turned it upside down looking for money. They would call social services. The drum beat in her head is her own. I understand my job more and more as a fellow traveler with her along the road is to stand back for her to learn through natural results of her own behavior and choices and yet to also help her find her own way, gently. I have offered to set the alarm super early tomorrow to assist – not take over – but to offer hands for picking up, return her to the system I tried to create for her when she was in NYC or perhaps to help her to come up with her own system. We are only here in our lives for such a short while. Having a place where things go seems to me a good way to enjoy the ride – but that may not be her journey. Meanwhile, let’s close the door and enjoy some Billy Collins! An adventure with friends, teachers, mountains, an ocean, food, plants, an elder, wise cat, a chaise by a window, a seat at the table with many. This was much for a solo flyer. Now I’m back. Now I am returning to the day to day busyness of my life at home but changed yet again, refreshed and exhausted. There are times I can recede and watch myself from an angle a bit above the tree line. My deep and energetic friend (who often appears and reflects a glimpse of me around the next bend in times of great pivoting) led me on adventures into spiritual and material realms – and in doing so, led my being to return to its body. Oh, I remember – this is what it means to be alive? Besides the habit to detach, I also often make choices in regards to practicality in order to be careful with money; eventhough, I learned as a small girl, a bargain isn’t always what it seems. My grandmother was a model in buying a few good things that would last a long time instead of stacks of cheap crap. Her cashmere coat hangs in my closet, still holding great structure and elegance. The Alive Being of Maren often helps me remember to relish the experience of being in a body – a practice of enjoying the cake, ordering the snippet of delish, luxuriating in the time of a sugar scrub or a destination in the woods, smelling the ginger as it is chopped, breaking out the china plates for no reason. Living fully and deeply is presence without the judgemental mind reeling and railing in a battle with cost versus goodness. Where does the beauty come in? Where is the time for seeing – really seeing the beauty in the eyes the craft the country half a world away. Can we allow the gifting of such beauty to help us to stop dead in our tracks and take it in – take in the intention behind every object, moment, encounter; gifting is as perceivable as light is to the eyes. the world can come alive in a single moment of stillness and receptivity. What do i carry in my pocket? Pebbles from another ocean? porcelain mice to drop in hidden gateways along the path? Do i listen to the music in the air? Do i watch the ant make its way? Do I hear The Verve singing to me in the coffee shop? Do I listen to the crow. The man so on the edge in his projected dialogue sings along to our conversation as we walk. Do i sit and quiet when i brew a cup of tea? Do I choose a teabag in a box of ordinary or Oh my gosh, that Steven Smith Teamaker who sends my tongue into raptorous joy? My mouth says to me, well, yeah, that is what I been trying to tell you! marga has chosen a life path immersed in the chaotic energy of teenagers, right now. I pull back and away from the frenetic energy, when actually the alchemy here is learning to stay in it, transmuting! Commuting moments in the car can make space for healing conversations, stolen moments on other sides of town morph into soul encounters, awkward chunks of time provide walks in nature. What is offered in the now? Trees sometimes offer caves in their trunks for crossing over – portals of roots for transporting the self deep into the earth – bark for rough and bracing tactile awakening. If your leaves are spread against the sky receiving direct signals from the sun and your roots are in the dark underbelly of the composting earth – are you not the ultimate yin and yang of balance? – how do I end up here – suddenly prostrate at the foot of the trees? a blog post is not a unified thing… the words flow where they will – and though I stand and teach the idea of the unification of ideas for students’ essays – i allow myself to flow where ever – capitals randomly applied. Dashes to break up words instead of periods. This space in this window is a fuzzy place between brain states – a place i can forget for a bit the rules – the linear flow – and find myself merging with the tree where roots and earth enter into mysterious exchanges – finding a vein I can ride up the elevator of life in the trunk and bask on the solar paneled roof of leaves against sky – listening to the life going on below in my belly, in my roots – to a place where all veins meet. We are such easy pickins’ – humans. We wear our desires on our faces. is a challenge as cute as stomping feet. that which we can easily teach ourselves. there is something so powerful in our surrendering. We sign contracts pledging our loyalty without asking to see proof. We give and lose and give again. One leg up, one leg down, one leg up again. in our hopes for a gentle rub. don’t understand the strength in the weakness. yet leap from their own shadows. The mystery of the humans will never make sense. towering in his empire built on human backs? he can reign down blessings.